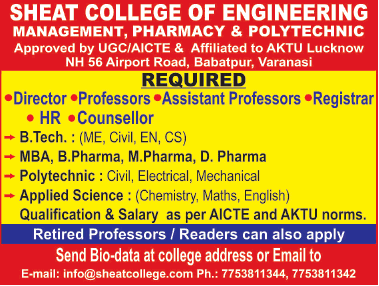 Sheat College of Engineering, Varanasi has advertised in THE TIMES OF INDIA newspaper for recruitment of Teaching Faculty- Professor / Assistant Professor / Director Plus Non-Faculty jobs vacancies. Interested and eligible job aspirants are requested to apply immediately from 06th February 2019. Check out further more details below. About College: SARASWATI HIGHER EDUCATION AND TECHNICAL COLLEGE established in the year 2007 in the holy city Varanasi, in premier institution in the field of technology education. The college in an outcome of the deep visionary pursuit of the philanthropic organization. As per AICTE / AKTU norms. Retired Professors and Readers can also apply.